"Newton would be astounded!" was the marketing phrase for original C6. Umm...yes, I think he would have been. 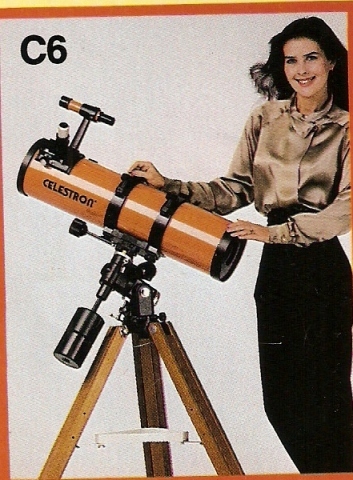 In the past I’ve talked about how much I enjoy classic black Celestron telescopes. Well, there is one telescope from that vintage that I’ve always admired but never owned: the Celestron Super Polaris C6 (SP-C6). This was a Vixen-manufactured 6″ f/5 Newtonian on Celestron’s Super Polaris German Equatorial mount — a heavier version of the excellent Polaris mount. 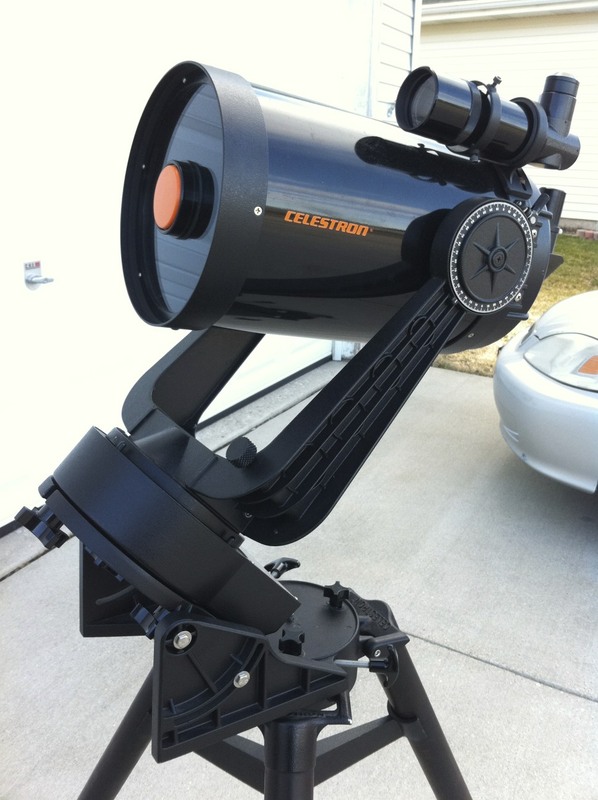 In fact, before the SP-C6, Celestron offered the C6, which was the same optical tube assembly (although painted funky orange) coupled with the Polaris mount. 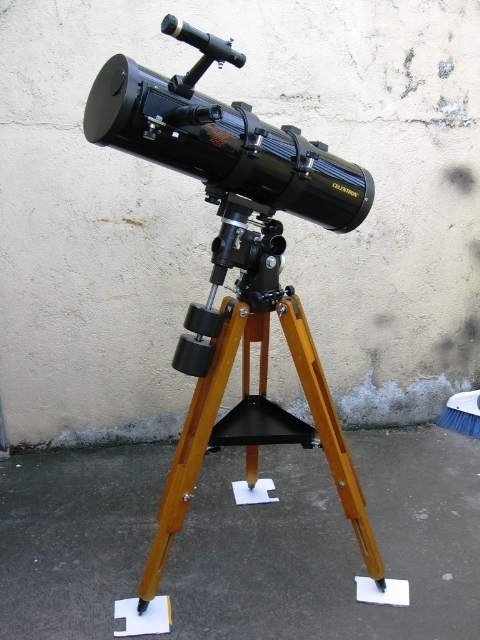 Anyway, about a month ago I was idly pursuing eBay on my iPad (yes, looking at used telescopes on eBay, Craigslist and Astromart constitutes recreation to me) and a few posts caught my eye: somebody had an SP-C6, and was selling it in two lots — the mount and the optical tube. The prices were very reasonable, as they often are a few days before auction close. Hmmm…what to do? The prices were too good, so I put in a bid on each. It lasted about a day, and then I was outbid. I decided that I would mount the C6 tube on the Polaris mount, so I dropped out of the SP bidding and upped my bid on the C6 … which lasted for about two hours. Then, I upped my bid one more time — at this point I was still getting this OTA for under $150 with shipping — and went to bed hopeful I would win the day. But of course, I was outbid again a few hours before the auction closed. At that point, I made the decision that I didn’t want to go any further, and let it go. Still, it hurt a little bit to see the notification that I lost when the auction finally ended. That SP-C6, or even a C6 setup, was still on my mind. Have I learned anything from this? Yes — at this point, I’d have to say I’m a telescope collector as much as an observer. I love to observe, and I love to teach astronomy and do public outreach, but I also am hopelessly enamored with telescopes themselves. Not really cameras, computers and electronics, but the telescopes and mounts themselves, their history and their varied design. This one was for sale, but in the Phillipines -- I think the shipping charges would have been a little too steep! My wife will probably read this and tell me this isn’t news to her. But after this latest episode, it dawned on me that some of the telescopes I have are there just because I like them, and I felt a little guilty about that. But then I realized that people collect guns, cameras, motorcycles, cars, Faberge eggs, and all sorts of things. So I got over it. Most of the classic telescopes I own are decidedly not GoTo. Maybe it’s because I grew up in an age where even PushTo telescopes were rare (in those days, we called those contraptions “Digital Setting Circles”). Perhaps it’s because the first serious telescope I had was a 10″ Coulter Dobsonian, and I just got very comfortable with star hopping. In any case, I have little patience for the ponderous and noisy systems of early “classic” GoTo scopes (which is why I’ve never had any desire for an LX200 or Ultima 2000). 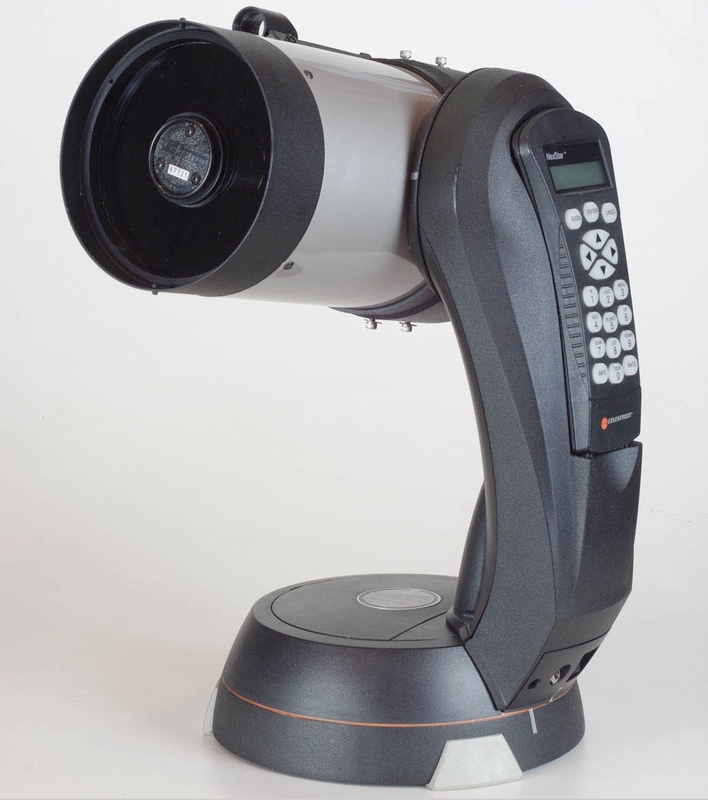 And yet…there is the Nexstar 5. The original. 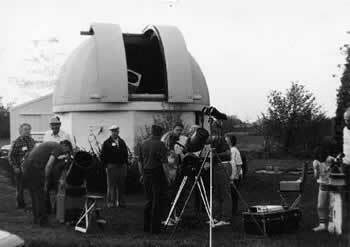 One of the early GoTo telescopes, and the grand-daddy of the long Nexstar line which extends into the present day. Why do I like this telescope so much? And why on Earth did I buy it twice? My experience in mechanical design may have something to do with it. I’ve been in the MCAD game for 19 years, and in my work I’ve met hundreds (more probably thousands) of engineers and designers. I have great respect for what these folks do. I’ve felt their pain and reveled in their triumphs on numerous occasions. Over time, I came to recognize design trends in consumer and industrial products, and I could tell that contemporary telescopes of the day were warmed-over, slightly updated versions of old designs. 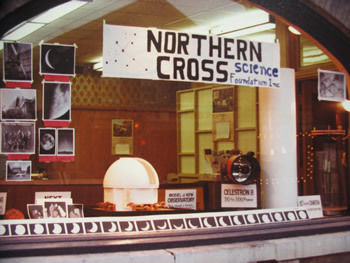 Sometimes the only thing that was new on a “new telescope” was the paint job and model name. The Nexstar 5, however, was a breath of fresh air. It wasn’t an evolution of the same single-arm mount from years past; it was a complete redesign. It looked good — really good. And it turned the heads of many astro-magazine readers, including mine. It had almost the same aperture as my trusty RV-6, but this was so much more portable. I could take it on an airplane to Australia, if I went there someday. It has to have a better GoTo system than the old Tangent-based systems — the hand controller is totally different. And, it would also be my first SCT. Gotta have at least one, right? 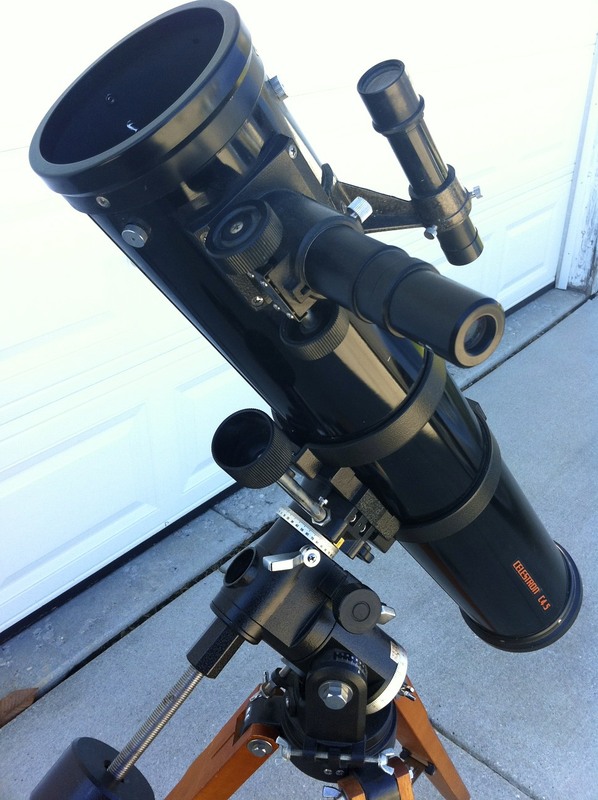 I purchased the telescope on the spot, and for the next week I had a few clear nights to use it. It looked awesome in my living room. But under the stars? It just didn’t seem to have any punch. I like planets and globulars, and they seemed soft. After that one week, I boxed up the whole thing and took it back to Eagle Optics. They graciously and cheerfully refunded my money, and that was it. It does look very cool. With the case, it’d be truly ready for travel. And maybe the first one was just a bad example, optically. And wow it looks really cool. Gotta pay with cash, but I have a tax refund that would more than cover it. I decided it was fate. 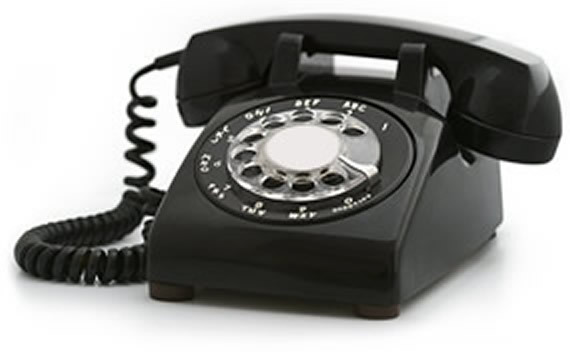 The response was sent, the deal was closed and scope was delivered inside of a week. What happened next? You’ll have to read about that next time.